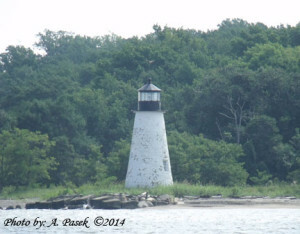 Pooles Island Lighthouse – Chesapeake Chapter U.S.L.H.S. NOTE: This light is off limits to the general public because the island was used for bombing and shelling practice from 1918 through the early 1960’s. There are many unexploded bombs and shells all over the island. The light on Pooles Island was authorized by Congress in May of 1824. John Donahoo was the low bidder for the contract to construct the light with a bid of $5,000. He completed work on the light in 1825. This light is the 4th oldest on the Bay behind Cape Henry (1791), Old and New Point Comfort (1804) lights. 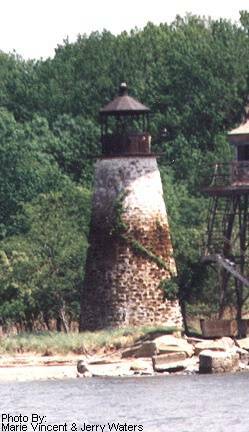 It is the oldest light still standing in Maryland. The height of the light was listed at 38 feet when it was in operation and 40 ½ feet to the top of the lantern room. The base of the tower is 18 feet tapering to a diameter of nine feet at the top of the stone tower. The interior spiral staircase is made from solid cut granite. The lantern room is constructed of cast iron. The light was stuccoed and white washed inside and out. In 1828 $2,800 was appropriated for a fog signal bell and tower. In 1857 the hanging, reflecting light system was replaced with a fourth order Fresnel lens. In 1917 the US Army condemned the island and made it part of the Aberdeen Proving Grounds. The Lighthouse Bureau agreed to automate the light if the Army would pay for the change. They did and the keeper and his family were transferred to Blackistone Island light on June 12, 1918. In 1939 the lighthouse was taken out of service and the lens was removed. The keepers quarters were torn down shortly after this. In 1994 the Army petitioned to have the light placed on the National Historic Register. In 1997 the Directorate of Safety, Health and Environment at Aberdeen Proving Ground with volunteers from the Proving Grounds with help from the Coast Guard and the National Park Service performed a full restoration of the tower. Equipment and supplies were brought in by landing craft. This restoration was performed in accordance with the guidelines established by the Secretary of the Interior and the National Park Service. This is another light that you can only get to by boat. To get “close enough” to see this light is difficult. The land area to the Northwest of the light is the closest point but it is part of the Edgewood Arsenal and one might have problems getting onto this military base. The closest point with known access is the town of Tolchester Beach. Here are some directions from the East side of the Chesapeake Bay Bridge on US Route 50. From the intersection of State Route 8 (Kent Point Road) go east on US Route 50 for 8.8 miles to the intersection with US Route 301. Turn left onto 301 and go 57 miles to the intersection with State Route 213, turn left onto 213 and go 18 miles until the intersection with SR 20. Turn left onto SR 20 and go 8.5 miles until the intersection with SR 21 on the right. Turn right onto SR 21 (Caulks Field Road) and go 3.3 miles to the end of the road at Tolchester Beach. The lighthouse should be visible looking up the Bay to the northwest at a distance of 4.3 miles.